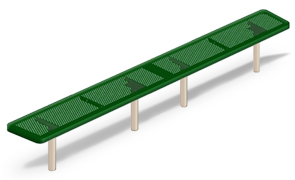 These high quality Players benches combine the dependable strength of steel fabrication with the latest thermoplastic coating technologies to create a bench that will withstand even the harshest weather conditions. Small perforated holes create a smooth surface for comfortable seating, and the varied lengths of benches enable this series to meet any seating needs. Strong 2-3/8" O.D. powder-coated legs. At 15" wide, benches are available in lengths of 4', 6', 8', 10', and 15' in your choice of portable, in-ground	or surface mounts. Optional grout covers can also be ordered with in-ground and surface mounts. Choose from a wide variety of colors to match the bench frames and seats to your team colors. Frame is powder-coated while the bench seat is finished in with a lightly textured Polyethylene in your choice of color options as shown.